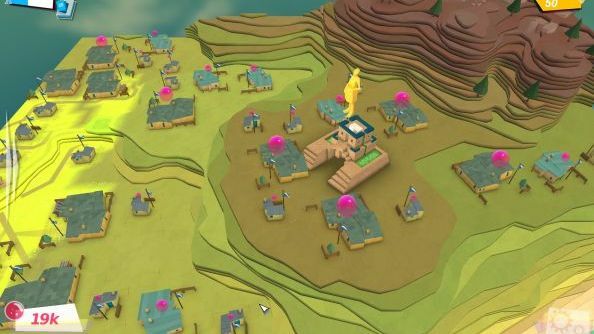 An early version of Godus was made available to buy on Steam last week. We’ve been playing it over the weekend to understand if it’s worth your time and money. Why do we review games before they’re finished? Here’s our reasoning. Godus, in its early access state, is alarmingly slim. That’s par for the course with early access games on Steam. The problem is, the ambition for Godus simply cannot match the reality of what’s delivered right now. It’s a fascinating game but I have serious questions about the viability of the mechanics going forward, and whether the promises that the developers have made for Godus going forward can ever be made real. There are so few mechanics in Godus, I think I can probably list exactly how it plays in this first paragraph. You are a god who can raise and elevate land. Your power depends on belief, and belief depends on the number of settlers you home. Homes require flat land. Sometimes, there is treasure buried under the surface that requires you to dig a hole. Godus doesn’t feel like a god game. I think that’s the core problem. I like the terrain moulding tool – a few mouse clicks are all you need build mountains or carve chasms. It’s a lovely thing: it has that same distracting “I’ll just work on this little bit here”, sense of Minecraft, where half an hour later you look up and realise you’ve been completely absorbed in levelling a mountain. The problem is what happens next: your tribesmen and followers all migrate to the new area and begin building their towns and villages. You don’t lay down roads, and figuring out the optimal packing for each settlement is entirely optional. There’s no real decision making beyond flattening a plain. What’s interesting though, is that it takes place on a vast map. You can scroll and scroll and scroll and not reach the edges. Again, the Minecraft reference: if you have the patience, there is a lot of geography in Godus to flatten. Once the settlers are in, they’ll breed and believe. New settlers can then be frogmarched out into the wilderness to build further. Meanwhile, the house (it’s hard to believe there’s anyone in there, given how lifeless cities are) starts growing a bubble of pink belief juice that can be harvested by clicking on it. As you grow your tribe, you’re able to push the boundaries of your civilisation, which leads to more plots for houses, which means more expansion. It’s a mostly virtuous circle. Theoretically, you’re trying to drive your race forward. That relies on finding small prizes of resources that are hidden in the world. Surprise: that requires clicking. Treasure chests are buried under layers of crust; retrieving them is about rampantly right clicking until the lid can be opened. More clicking. Click faster. Click better. Click stronger. There are all kinds of problems with Godus’s advancement. First of all, finding this treasure is mindless tedium. Second, it’s an entirely automatic process in which the resources you find are automatically assigned to the next advancement tree. Thirdly, most of the advancements mean toss all. In one obvious example learning “families” meant that my followers would breed faster. But there’s no sense that anything has changed on the map – no little kiddies running about the place, or followers holding hands or sticking together. Advancement, thankfully, does one job: you’ll eventually earn the ability to link your houses into settlements – where the belief juice can be harvested in one click. There are other ways to advance: you can take part in scripted skirmishes against AI players that are accessed through a statue in the main overworld. These are simple battles that only take a few minutes to complete. You win by clicking to flatten plains. Very, very fast. They should be more fun, more focused. But they’re just not – the AI players you’re fighting against are nearly braindead, and again, there’s no strategy. Click. Click harder. Click hard with a vengeance. Now, let’s be clear again. This version of Godus is way early. It’s clearly marked Early Access. The game’s barely in alpha. But it’s currently the number one selling game on Steam. And it’s not really much fun. In fact, I’ll go further. It’s boring. There is barely a game here: no decisions to be made, no plans to concoct, no personalities to interact with, and the multiplayer barely functions. It’s little more than a tech demo, and frankly, the tech isn’t that impressive. The Godus team are clearly reactive to feedback: for example the game still contains remnants and the interface of a microtransaction store that was quickly removed after the (rightful) uproar. But that just says that you don’t need to buy this game right now. 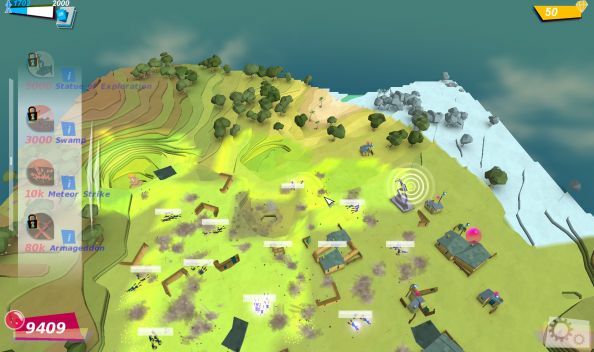 The Godus team have promised the world – and you can see and read about what they’re trying to do from their Kickstarter. If you want to back that concept, you should. Everyone else – I strongly advise you to wait and see if they can come anywhere close to delivery. 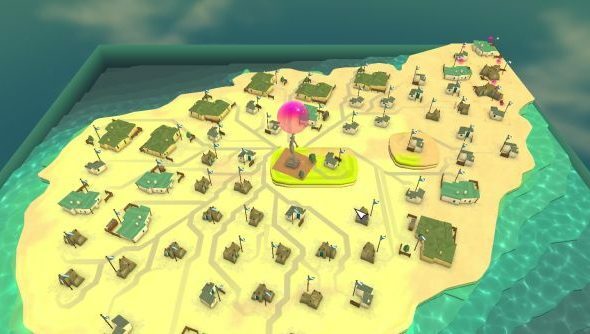 After a long period in incubation, 22Cans have released an update to Godus that they claim will radically improve the game. The update adds new ways of controlling and directing your tribes people, and reduces the number of clicks required to flatten land. The chests that are hidden underground now reveal stickers, a kind of currency that is spent on unlocking new god powers and building upgrades. But they don’t change the fundamentals of Godus’ design: the game is still ferociously boring. It is still purely about flattening land onto which your settlers build. There is zero strategy involved in building your settlements, and zero choice in how you progress through the game. Godus is still a game you should avoid.